The whole thing reminded me of a delightful story by Anne Kadet that ran in the Wall Street Journal earlier this month. She discovered a stop on Christopher Street named “World’s Smallest Store.” Its proprietor calls himself “Parks Are Zoos For Trees” and claims he hails from Atlantis. He and fellow artists produce the store’s merchandise: hand-screened shirts, as well as “jewelry, a hands-free rope dog leash (it wraps around your waist), crocheted hats and a pair of underwear hand-painted with the catchy slogan: ‘I Hate My Dad. '” Kadet writes of Parks Are Zoos For Trees, “He says nothing in the shop costs more than $150, but beyond that, the prices are anyone’s guess—he makes them up as he goes along. The store is open when he feels like it, though he tends to work long hours (sales to tipsy bar-goers spike at 3 a.m.).” He also gives out free advice, and, at least while Kadet was visiting, free popcorn. Anyway, at La Boîte’s party, the biscuits — with ingredients including curry, orange and dark chocolate — were free but the art wasn’t. If it had been, I would have taken it all home. The artist showing is New Orleans-based Sarah Ashley Longshore, whose Warhol-esque artwork is collected by the likes of actress Blake Lively. 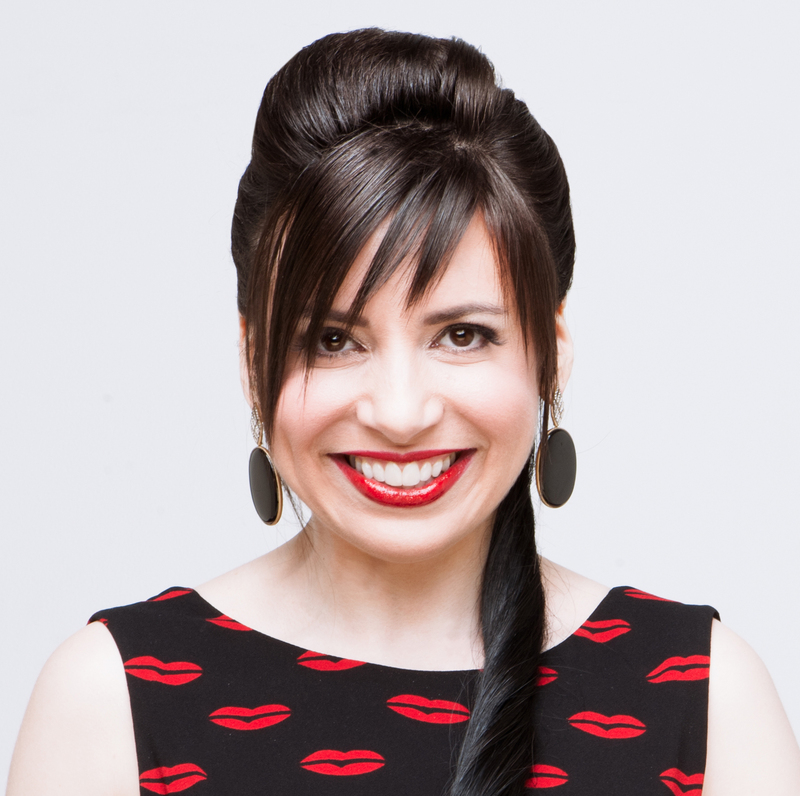 I totally fell for what Longshore calls her “vibrant fusion of pop culture iconography and … view of the world around me.” Audrey Hepburn is one of her subjects; Vogue editor Anna Wintour is another. 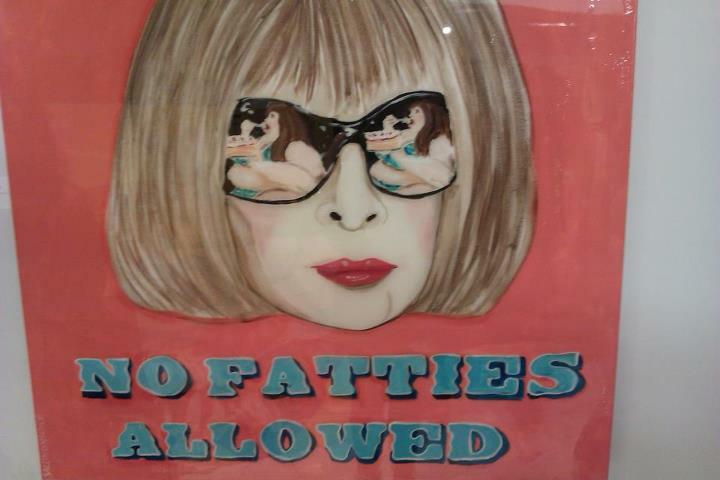 Anna Wintour painting photographed by Stacy Lomman. I was thrilled to meet the artist, who is clearly my sole-mate — she was wearing a pair of the Prada flame heels that I covet. 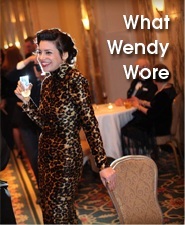 I had her pose with another of her Anna Wintour paintings. Longshore with an Anna Wintour painting. But this is the painting I want. The iPhone doesn't do the colors and textures justice. This painting glows! 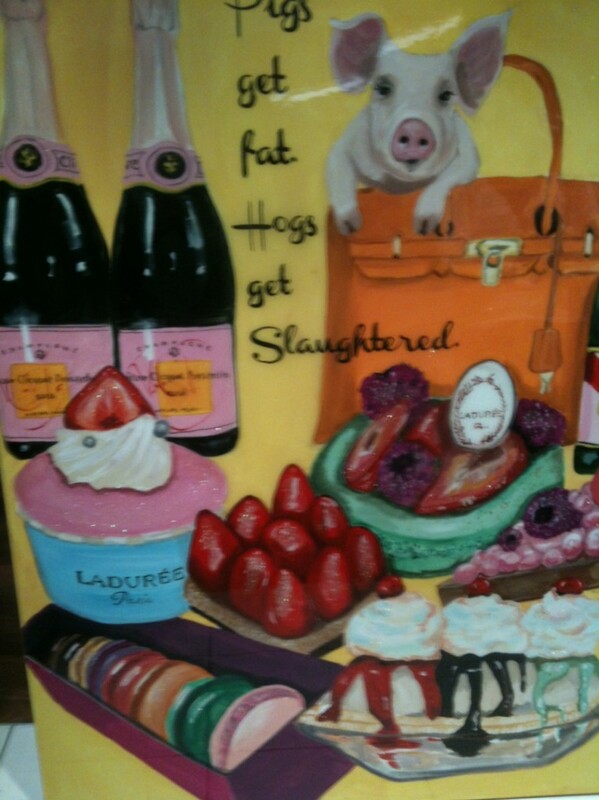 It’s 5′ by 4′ and it’s got all my favorite “P” words represented in it: pink Champagne, pastry, a pig with eyelashes and a purse. I took this photo of the painting and the artist to show the painting's size. I rushed home and told MrB that I had to have this painting. He didn’t seem to take me very seriously. I think that’s because of our discussion the previous night about what I’d like to do with the Mega Millions money. I told him I want to go back to school to get an advanced degree in medieval studies, produce only custom-ordered jewelry and devote the rest of my time to philanthropy. And I would never fly coach again. He agreed that those were good ideas. Then I said I’d also like to get a slightly larger apartment so I could have a third dog, plus a cat, a hamster, a guinea pig, a chinchilla and some fish. He laughed his head off, then tried to rile me up by offering me a chinchilla coat in lieu of a pet chinchilla. I was not amused. Since then I’ve overheard him on the phone, sharing his thoughts about my future chinchilla with other people. Humph. I’m going to tell him that only the gift of a Longshore pig painting will persuade me to forgive him for such impertinence. 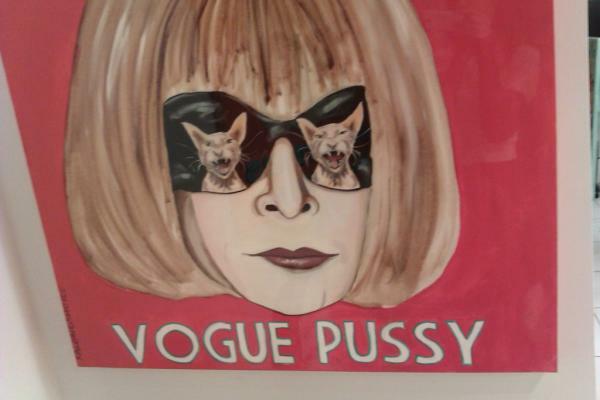 Love these paintings…especially the Anna Wintour ones. When I watched “The September Issue” a few years ago, Nick called her “Voldemort’s Sister”. Let us know where you’re going to hang the picture. How dare he mock your chinchilla dreams! I had that one all ready for you. 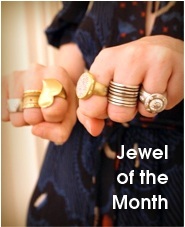 I will bring it up personally when you win. Also, want to add a goat or cat or something? I’ve got a few in inventory. We have our lottery plans all made too so step off. Anti-spam word = prosecco! how appropriate! My great aunt Jean once decided she would have a small chinchilla farm to help support her after she retired. However, she couldn’t do the deed and ended up with about 18 chinchilla pets. They were pretty cute. Henry and Gigi need a new friend, right? It’s for the best when animals out number humans in a house. Well, if you really want a little Kitten, I’m on my way! I would have loved to see Ms Longshore’s work – she has captured Anna’s Grimace perfectly. 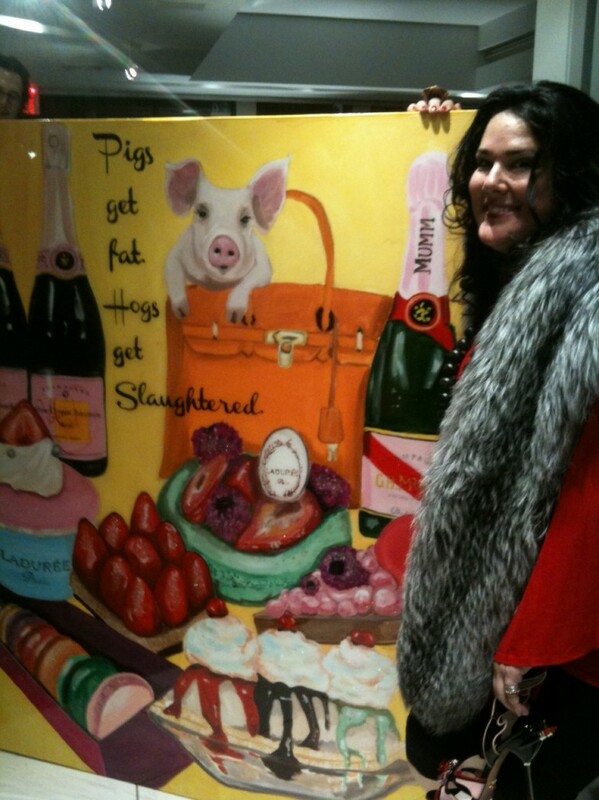 Love the Piggy painting, tres Fun. As a professional marriage counselor, I applaud your gentle use of humor to communicate your desires! What a wonderful painting. The artists looks delightfully mischievous and smart. I can see why you want that painting. I would take them all home too. I admire your dreams and hope they come true. I was looking at that restaurant you mentioned in the beginning. YUM.